It feels good to be putting my mind to working on projects and bringing them to a conclusion. I've finished the Malabrigo Linen Scarf, worn it, and am thinking of making another some day in the future. 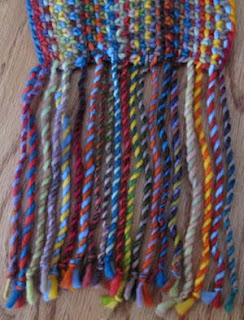 Next time I'll likely make one with yarn that I already have as it's such a good stash buster. . I also picked up another project that has been languishing for a while, the Damson shawlette. When I set it down before moving to Calgary I only had a few rows done in the garter stitch section. This week I found that it was a good knitting-with-hockey project and I'm now about 95% finished. It's been working up quickly - only 5 more rows to go, plus the bind off and blocking. And....I'm ready to start a new from-the-stash project: the Sprössling Cardigan by Anne Hanson. More of these last two projects later on. Notes: When the kit arrived the first impression I had was that it didn't look like much yarn. As it tuns out, I was right. I ran out of yarn on a number of rows and found a knot on the yarn for the bind off row. On one of the rows I ran out of yarn with only 8 stitches left to do, plus the length needed for the fringe. On another row I ran out with 36 stitches left. I found this to be very frustrating. True, it was easy enough to splice yarn left over from other rows (and there wasn't much left over), but it shouldn't have been necessary. I've read various posts that this is a common problem with these kits. Other knitters seemed to be okay with the shortages and the need to splice the yarn. I think that the kits should have been stocked with enough yarn. I did the two-color cast on, so that's not why I was short on yarn. The fringe is 8” but I admit that it might have been 8-1/2", maybe even 9" in places. I would have gladly paid a little extra in order to have the peace of mind that I wasn’t going to run out of yarn. By the way, my gauge is correct. I did the bind off in rib as I thought it looked tidier. I finished the fringe a little differently than described in the pattern. I twisted one single strand, then a second, and then tied them together. Since there was an odd number of fringe ends, one of the fringes on each end of the scarf has 3 strands and it blends right in. You wouldn’t notice it unless you were looking for it. This method gave me thinner fringes and more of them, which is what I was going for. All in all, it's a good pattern and the colors are beautiful. If I make another Linen Scarf in the future I'll use stash yarn, or share skeins of Malabrigo with friends in order to keep the cost down. However, I won't be buying another kit. The frustrations with yarn shortages diminished the enjoyment of what is a very nice project.